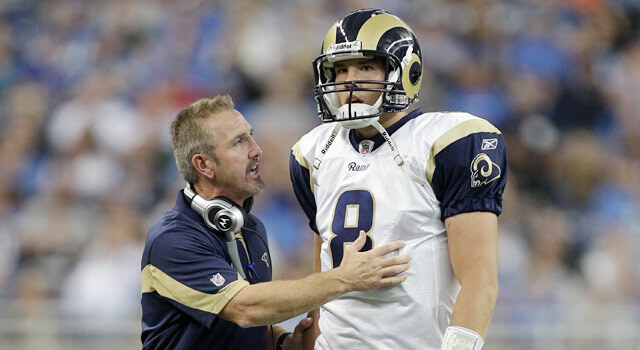 Published: Oct. 19, 2010 at 05:34 p.m.
Steve Spagnuolo and Sam Bradford are being recognized for helping the Rams become a legit NFC West contender. As crazy as that thought might have seemed for the St. Louis Rams prior to the season, coach Steve Spagnuolo has his young squad believing that they are capable of pulling off the stunning turnaround. The Rams have won three of their last four games, and have positioned themselves to be players in the NFC West. Currently 3-3, the Rams are only seven points away from being tied for the league's best record (St. Louis lost to Arizona and Oakland by a combined six points). Of course, some will snicker at the notion of a franchise mired in futility (Rams lost 42 of 48 games the previous three seasons) quickly transforming into a playoff contender, but St. Louis has assembled the requisite pieces to do just that. In a quarterback-driven league, St. Louis has a franchise player at the position in rookie Sam Bradford. The top overall pick has been superb directing the offense despite lacking a true No.1 receiver. Although his numbers would suggest that he has struggled, Bradford has displayed the poise, confidence and leadership skills of a winner. He has already shown his teammates that he is capable of acting as the driving force of the offense by making critical plays in each of their victories. Against the Chargers, that play came in the form of a 38-yard bomb to Danario Alexander that broke the game open in the first quarter. The high-arching toss was a tone-setter for the Rams, as it got the offense off to another fast start against a quality opponent, and loosened up the eight-man front that the Chargers intended to use to slow down Steven Jackson. Jackson has also been a critical part of the Rams' rebuilding efforts with his hard-nosed running style. He gives the team a presence in the backfield, and alleviates the pressure on Bradford to solely carry the offense. He has topped the 100-yard rushing mark in back-to-back games, and ranks seventh in the league in rushing yards per game (84.5). With a re-tooled offensive line capable of dominating up front, the Rams' two-pronged attack featuring Jackson and Bradford has been enough to keep defenses off balance. While the offense has garnered most of the headlines, it has been the defense that has been the true catalyst. Fueled by Spagnuolo's ultra-aggressive schemes, the Rams have held five of their six opponents to 17 points or fewer, and emerged as one of the league's better pass rushing units. Their 17 sacks rank sixth in the league, and opponents are wilting under the pressure that the Rams consistently bring. While the unit is far from a finished product, the energy, enthusiasm and relentless passion the group is starting to show gives the defense a chance to develop into an upper-echelon unit by season's end. The visual evidence of Spagnuolo's guidance is also apparent in the resiliency that the Rams have displayed. St. Louis knocked off a Chargers team that ranked No.1 in total offense and defense only a week after suffering a 44-6 trouncing at the hands of a winless Detroit Lions squad. While this might not rank as a huge surprise in a league that is full of parity, the fact that his young team has learned to win big games only a year after suffering through one of the worst seasons in NFL history indicates that Spagnuolo never lost the trust or respect of his players. Given the importance of chemistry between coach and player, that strong connection might be the reason the Rams emerge to wear the division crown, and Spagnuolo walks away with a Coach of the Year award. 1. Mike Tomlin, Steelers (Week 5 ranking, 1): If it is true that a team takes on the personality of its coach, then the Steelers' hard-nosed mentality is testament to the no-nonsense approach of its leader. 2. Todd Haley, Chiefs (2): The Chiefs are beginning to look like the team to beat in the AFC West despite a current two-game losing streak. While a lot of the credit should go to coordinators Romeo Crennel and Charlie Weis, Haley's master plan looks like a long-term success in Kansas City. 3. Rex Ryan, Jets (4): The Jets' boisterous coach has rubbed many the wrong way, but his team has backed up his tough talk by reeling off five consecutive wins. 4. Steve Spagnuolo, Rams (NR): See above. 5. Pete Carroll, Seahawks (NR): Seattle got a surprising win on the road to reclaim a share of the NFC West lead. While some might laugh at Carroll's collegiate enthusiasm, his players are buying into his passion and responding with solid play in all three phases. Previously rated: Raheem Morris, Buccaneers (3) and Mike Smith, Falcons (5). 1. Peyton Manning, Colts, QB (1): He continues to drive the Colts to another division crown with his stellar play. Manning leads the league with 13 touchdown passes, and ranks second with a 103.4 passer rating. 2. Tom Brady, Patriots, QB (2): He didn't appear fazed by the loss of Randy Moss during the Patriots' 23-20 victory over the Baltimore Ravens. Although he turned the ball over twice, he delivered again with the game on the line and rallied his team from a 10-point fourth-quarter deficit. 3. Drew Brees, Saints, QB (NR): He bounced back from his disappointing performance against the Cardinals. Brees' three-touchdown effort against the Buccaneers places him right behind Manning in touchdown passes with 12. 4. Aaron Rodgers, Packers, QB (3): He couldn't prevent the Packers from dropping their first home game despite posting his second 300-yard passing day of the season. 5. LaDainian Tomlinson, Jets, RB (NR): After enduring a host of criticism following an injury-related two-year slump, Tomlinson is proving to skeptics that he still has a little juice left in the tank. He is averaging 5.3 yards per carry, which ties his career best, and has five rushing touchdowns while sparking the Jets to a five-game winning streak. Previously rated: Matt Ryan, Falcons, QB (4) and Mark Sanchez, Jets, QB (5). 1. Kyle Orton, Broncos, QB (1): He is quietly putting together an outstanding season while directing the Broncos' spread offense. Even though the Broncos are tied for last in the AFC West at 2-4, Orton's efficient play has made their offense a nightmare to face. 2. Philip Rivers, Chargers, QB (2): If the Chargers weren't off to such a disappointing start, Rivers would be near the top of the MVP race. He ranks as the league's passing leader with 2,008 yards, and is near the top in touchdowns and passer rating. 3. Peyton Manning, Colts, QB (3): See above. 4. Arian Foster, Texans, RB (5): The league's rushing leader has been the catalyst to the Texans' explosive offense. Though Foster's hard-running style has drawn attention, it has been his ability to catch the ball effectively that has added another dimension for Houston. 5. Michael Vick, Eagles, QB (4): Although the drumbeat to play Kevin Kolb is growing louder, Eagles fans should remember that Vick still remains the league leader in passer rating (108.8), and has six touchdown passes without an interception. 1. Clay Matthews, Packers, LB (1): The Packers dearly missed the NFL leader in sacks (8.5) against the Dolphins. The team failed to record a sack, and was unable to generate any pressure on Chad Henne. 2. James Harrison, Steelers, LB (2): He might be the most feared pass rusher in the game due to his extraordinary skills and nasty temperament. Harrison has 4.5 sacks, forced four fumbles and sent a host of opposing players to the sidelines with teeth-rattling shots. 3. DeMarcus Ware, Cowboys, LB (3): If you're looking for the bright spot in Dallas, then you should look hard at No. 94. He has been a dominant force off the edge, and his relentless pressure has helped the team stay in games. 4. Osi Umenyiora, Giants, DE (NR): Though he seemingly fell off the map a year ago, Umenyiora has been a key cog in the Giants' sudden resurgence. His disruptive rush skills (eight sacks and seven forced fumbles) have helped the Giants emerge as the league's second-best defense. 5. Shaun Phillips, Chargers, LB (4): The Chargers' 2-4 record would suggest that they are struggling defensively, but few know that they have the top-ranked unit in the league. Led by Phillips, who has six sacks, the Chargers have 21 as a unit, which is tied for second in the league. Previously rated: Julius Peppers, Bears, DE (5). 1. Sam Bradford, Rams, QB (1): It's not a coincidence that the Rams have a legitimate shot at winning the NFC West in Bradford's first season. He has been outstanding directing their offense, and shows all of the qualities of developing into a franchise quarterback. 2. Jahvid Best, Lions, RB (2): Though he was unable to get going against the Giants on the ground (12 carries for 16 yards), Best remains a multi-purpose threat. He leads all rookies in receptions (31), and ranks third in rushing yards with 257. 3. Mike Williams, Buccaneers, WR (4): He has quickly emerged as Josh Freeman's No.1 option. Williams is second on the Buccaneers with 23 receptions, which is also second among all NFL rookies. 4. Aaron Hernandez, Patriots, TE (NR): Randy Moss' departure has thrust Hernandez into the spotlight, and the rookie has shown that he is ready for a starring role. With seven receptions over 20 yards and 11 catches resulting in first downs, Hernandez is quickly becoming one of Tom Brady's favorite targets. 5. Chris Ivory, Saints, RB (NR): Who is Chris Ivory? That's what Tampa Bay's defense was asking prior to the rookie busting out for 158 rushing yards on only 15 carries. With a robust average of 6.3 yards per attempt, Ivory will still be a factor in the running game when Pierre Thomas and Reggie Bush return. Previously rated: Ryan Mathews, Chargers, RB (3) and Dez Bryant, Cowboys, WR (5). 1. Ndamukong Suh, Lions, DT (1): If you want to know why the Lions are more competitive, then you should pop in a tape of Suh dominating the line of scrimmage. He leads all defensive tackles with 4.5 sacks, and is garnering some buzz as a Pro Bowler. 2. Nate Allen, Eagles, S (2): He entered the league lauded for his ability to come down with game-changing interceptions, and he has not disappointed with three picks. 3. Earl Thomas, Seahawks, S (3): He has been as good as advertised as a playmaker in the middle of the field. While some of his success can be attributed to his physical skills, his commitment to tape study has helped him play with the instincts and maturity of a veteran. 4. T.J. Ward, S, Browns (4): The Browns have to be pleased with the menacing presence that Ward has brought to their secondary. He not only leads all rookies in tackles (54), but his penchant for delivering big shots has receivers running with their head on a swivel. 5. Brandon Spikes, Patriots, LB (NR): This old-school linebacker has been an ideal fit for the Patriots. Though he lacks the speed and quickness of some of his counterparts, his instincts allow him to make plays from sideline to sideline. Don't believe me? Check out a replay of his 16-tackle effort against the Ravens. Previously rated: Rolando McClain, Raiders, LB (5).